General anesthesia drugs are used to induce a sedative state in patients who are to go through a surgical procedure. Further, general anesthesia drugs can be segmented into two sub-segments based on the route of administration, general anesthesia drugs administered through the intravenous route is categorized as an intravenous anaesthetic and general anesthesia drugs administered through inhalation is categorized as an inhalation anaesthetic. It is a must to maintain the sedative stage in the patient during a surgical procedure, usually for this stage, inhalation anaesthesia are administered to the patients; while for the induction stage, intravenous general anaesthesia s is preferred. In terms of value, the global general anesthesia drugs market is estimated to expand at a CAGR of 3.8% during the forecast period. Moreover, global general anesthesia drugs markets value is expected to increase to US$ 5,549.7 Mn by 2025 end. Growth of the global general anesthesia drugs market is mainly driven by rising incidences of cardiovascular diseases, chronic respiratory diseases, craniomaxillofacial surgeries and accidents. However, lack of a single effective drug for all type of surgeries, side effects and complications during the surgical procedure, lack of skilled anaesthesiologists and certified registered nurse anaesthesiologists, inadequate insurance coverage, coupled with high prices of these drugs are restraining market growth. In addition, side effects such as nausea, vomiting, allergy, sleep apnea and complications during surgical procedures are anticipated to drive the demand for improvement in the quality of drugs. The global general anesthesia drugs market is segmented on the basis of molecule/product. In terms of value, the propofol segment is estimated to account for over 29.8% share to the global general anesthesia drugs market by 2015 end and is expected to remain dominant during the forecast period. The global general anesthesia drugs market has been segmented into seven major regions, namely: North America, Latin America, Eastern Europe, Western Europe, Asia Pacific Excluding Japan (APEJ), Japan, and Middle East & Africa. In terms of value, North America is estimated to dominate the market with 31.0% share of the overall general anesthesia drugs market by 2015 end. APEJ is estimated to be the fastest-growing market, registering a CAGR of 5.2% in terms of value, over the forecast period. Some of the key players identified in the global general anesthesia drugs market report include Baxter International Inc., AstraZeneca, AbbVie Inc., B. Braun Melsungen AG, Fresenius SE & Co. KGaA, and Hospira Inc. These players are focused on developing new drugs with minimum side effects and maximum efficacy to seize the maximum of the global market share. Future Market Insights offers a 10-year forecast of the global general anesthesia drugs market between 2015 and 2025. In terms of value, the market is expected to register a CAGR of 3.8% during the projected period. This study demonstrates market dynamics and trends in all seven regions that influence the current environment and future status of the general anesthesia drugs market over the forecast period. This Future Market Insights report examines the general anesthesia drugs market for the period of 2015–2025. The primary objective of the report is to offer insights into developments in the general anesthesia drugs market that are significantly transforming global businesses and enterprises. Increasing incidences of cardiovascular and chronic diseases, coupled with rising demand for surgical procedures is predicted to increase usages of general anesthesia drugs worldwide. This is expected to bolster growth of the general anesthesia drugs market over the next five to six years. Increasing demand for inhalation general anesthesia drugs, for maintaining the sedative stage during surgical procedures, especially among the children and elderly population is expected to drive growth of general anesthesia drugs market during the forecast period. Companies are focused on populations driving the market such as: Asia Pacific and MEA, where incidences of cardiovascular and chronic disease are increasing, this is expected to further increase the demand of general anesthesia drugs during surgical procedures. The general anesthesia drugs market report begins with an overview of the general anesthesia drugs market in terms of value. This section includes FMI’s analysis of key trends, drivers and restraints, and opportunity, all factors that are influencing the general anesthesia drugs market. Impact analysis of key growth drivers and restraints, based on the weighted average model is included in the general anesthesia drugs market report to better equip clients with crystal clear decision-making insights. The global general anesthesia drugs market is segmented on the basis of products type as: Propofol, Sevoflurane, Dexmedetomidine, Desflurane, Remifentanil, Midazolam and Others.A detailed analysis has been provided for every segment in terms of market size, Y-o-Y growth rate, absolute $ opportunity, and BPS analysis, for general anesthesia drugs market across the globe. The next section of the report highlights general anesthesia drugs adoption by region. It provides a market outlook for 2015–2025 and sets the forecast within the context of the general anesthesia drugs market. The study discusses the key regional trends contributing to growth of the general anesthesia drugs market worldwide, as well as analyses the extent to which drivers are influencing this market in each region. Key regions assessed in this report include North America, Latin America, Western Europe, Eastern Europe, Asia Pacific Excluding Japan (APEJ), Japan and Middle East & Africa. All the above sections, by product type and region, evaluate the present scenario and growth prospects of the general anesthesia drugs market for the period 2015 –2025. We have considered 2014 as the base year and provide data for the following 12 months. To calculate general anesthesia drugs market size, we have also considered revenue generated by the manufacturers. The forecast presented here assesses the total revenue by value across the general anesthesia drugs market. In order to offer an accurate forecast, we started by sizing the current market, which forms the basis of how the general anesthesia drugs market is expected to develop in the future. Given the characteristics of the market, we triangulated the outcome of three different types of analysis, based on supply side, downstream industry demand and the economic envelope. In addition, it is imperative to note that in an ever-fluctuating global economy, we not only conduct forecasts in terms of CAGR, but also analyse on the basis of key parameters such as year-on-year (Y-o-Y) growth rates to understand the predictability of the market and to identify the right opportunities across the general anesthesia drugs market. As previously highlighted, the general anesthesia drugs market is split into a number of segments. 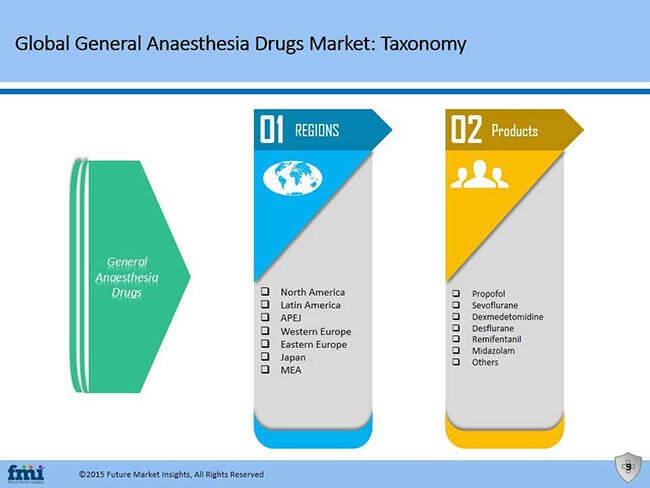 All the general anesthesia drugs segments in terms of product and regions are analysed in terms of Basis Point Share to understand individual segment’s relative contributions to market growth. This detailed level of information is important for identification of various key trends in the general anesthesia drugs market. Another key feature of this report is the analysis of all key segments in terms of absolute dollar opportunity. This is traditionally overlooked while forecasting the market. However, absolute dollar opportunity is critical for assessing the level of opportunity that a provider can look to achieve, as well as to identify potential resources from a sales and delivery perspective of the general anesthesia drugs market. To understand key growth segments in terms of growth and adoption for —cardiovascular disease (CVD) and chronic disease— surgical procedures across the globe in the near future, Future Market Insights developed the general anesthesia drugs market ‘Attractiveness Index’. The resulting index should help providers identify real market opportunities. In the final section of the report, general anesthesia drugs a ‘Competitive Landscape’ is included to provide report audiences with a dashboard view, based on categories of providers in the value chain of the general anesthesia drugs product portfolio and key differentiators. Key categories of providers covered in the report are general anaesthesia drug manufacturers. This section is primarily designed to provide clients with an objective and detailed comparative assessment of key providers specific to a market segment in the general anesthesia drugs value chain and the potential players for the same. Report audiences can gain segment-specific vendor insights to identify and evaluate key competitors based on in-depth assessment of capabilities and successes in general anesthesia drugs marketplace. Detailed profiles of the providers are also included in the scope of the report to evaluate their long-term and short-term strategies, key offerings and recent developments in the general anesthesia drugs market. Key competitors covered in terms of manufacturers are: Baxter International Inc., AstraZeneca, AbbVie Inc., B. Braun Melsungen AG, Fresenius SE & Co. KGaA and Hospira Inc.